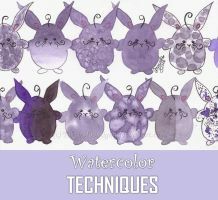 Which special effect do you like/use the most in your watercolor art? Love using salt, and spraying water/another colour into the paint. But i use gel pen the most. Becasue im an impatient human. The salt is something you can use almost too often. It's so easy to use and makes nice texture When I need a certain extra in my artworks and don't want to bother with it too much...the salt is a great option. That's why I need to remind myself "no salt this time, you already used it 1000x times"
I like to blot up color with coffee filters. You can do a lot with masking tape. It does give lovely 3D effect while you can still keep the colour transparent and now I'm actually able to paint on large canvas which is huge plus since I need fer larger pieces to my empty walls. Can you recommend any watercolor ground? Which one are you using now? There is only one brand I can get my hands on (I thought I could get another brand from US or Canada, but nope. No shipping available.) and only one painting I have done so far but I've been using Schmincke Aqua primer, coarse. It gave really nice structured surface. I now have same brand but fine ground. I personally wanted heavily structured surface which the fine ground won't allow to do but I guess I'll try it on wooden block or canvas at some point. I probably use it too heavy handed anyway. With the fine one only a thin layer should do so basically you should be able to do multiple canvasses etc. with it. I used to think that as well. Then I bought 100g yarn that was almost 30€. I was cured. I use acrylics with watercolor to make some parts of work stronger. Especially I like "White 2" by DELETER, because it's possible to mix it with water colours which makes them opaque. It's also great for adding highlights. Umm...that's something new for me ...I went to see this and read it's opaque, permanent, and waterproof But it's mostly used for manga drawing, right? Meanwhile I feel more comfortable drawing illustrations for kids than drawing mangas- but I kept my White 2 ink ^^ It's incredibly useful to fix mistakes and add tiny detail (because water colors mixed with ink are not only opaque, but also less fluid, more like toothpaste). I don't want to paint without it anymore. The only drawback is that it really becomes waterproof once it's dry. It takes a few minutes for it to dry, but once it has happened, there's no way of removing it, exept by putting new layers of color over it. Didn't we all dream of becoming a mangaka? I didn't know that there were so many effect techniques! so gonna google those and try them out! I still haven't ventured too far into the effects, but I use rubber cement a lot on my main subjects once I finish their color (or the majority of it) so I can then go crazy on the background without fear of ruining my subjects. Do you go over it where you have colored it? Doesn't it damage the color (+paper) ? I always used the masking fluid on blank, white paper parts (before I started to paint)...but haven't tried to apply it where I have already colored it. I couldn't find the fiskars masking fluid and someone suggested rubber cement to me. I do use it after I lay down the colors and once it is dry I use a pink eraser to gently rub it away. I didn't find that it damaged the paper at all. Maybe the tiniest hues came off, but not even barely, because I wait until the paper is completely dry before I apply it. I guess it is just preference which order you do it in. I do think it all comes down to how you remove it though, I just use the pink eraser side of my pencils (works really nicely) making sure I don't apply too much pressure. I used it here on the eagles (I colored them first before the lake and background) Oh and don't judge the method on my art level, that was my first watercolor painting. My first watercolor painting wasn't a master piece either And for your first try, you shouldn't be ashamed! That's the point in our polls to talk to each other, to share information. We all learn...I'm painting for quite a while and still learn something new or don't know everything. I think you need to add "resist" effect, like using oil pastels or crayons. It's a cool technique I'd love to experiment on more myself. There are so many "effects" that you easily can forget some of them That's why we have the option "other"
I don't know why but so far I always failed using table (and sea) salt & alcohol, the effects just don't show up much. Any tips will be appreciated. With salt it's important how wet the color is (but don't use to much water either!) and how much salt you use. The shinier/wetter the color is, the more blurry and bigger shapes will appear. If the color has dried a little bit, the effect will show in the shape of tiny little stars or little dots. And then the adding of salt...the more you manage to sprinkle it in fewer grains the better. If you drop clusters of salt on the paper you will only get a weird wet looking hill of salt on the paper. The more you are able to disperse the salt the better. Don't add too much salt on one small area, this will only "suffocate" the effect. I'm still not able to get it 100% right each time. So it's a tricky thing sometimes, when you expect to see large crystals to show up, but you get only small tiny dots on your paper...or vice versa. Do some testing. Try using salt on differently wet color. Add salt as soon as you applied the wet color, the next one wait for the color to dry a little bit, just to have some shine, the next when it's almost completely dry. Some tones (pigments) of color do better with salt some not...mostly a darker color, richer in pigment the more likely you will have a better result. But not always. Personal I haven't use this one (it's quite expensive for me to play around)....so I can't help you. Wow thank you so much for the lengthy reply! Yeah I guess the pigment/watercolor paint quality affects a lot & I need more experiments on this. But then what's frustrating is after the water dries up, you have to remove the salt and often times they stick.. then I must use a rough brush to clean it all from the paper.. then the colors (and the salty effect) are ruined.. then the whole painting is damaged..! I take a regular paper and put it on top of the area where the salt is and do some circular movements (with the paper, of course) like you would use a grinding paper to smooth something. It's the same principle, only this time you want the salt to get removed. You don't need too much pressure to add. Those circular movements with the paper will break the salt from the paper. But be careful with the paper. Sometimes (it depends on the color you used, like magenta) the paper will get colored and if you use it on another part of the painting, color can transfer on it. Look from time to time on the other side of the paper if it's still usable, if not, take another one. And also maybe if you use a thin paper (like a copy, printing one) you can see it tear in the middle. Just try this on a testing "painting". Make a regular salt effect, leave it to dry and then use this blank paper to get rid of the salt. Oooo.. now that's something new, maybe it's not really new for others but I never heard this anywhere. AWESOME! Can't wait to try it, thanks again for the detailed tips! I don't really much other mediums at all with watercolour. But I will at times use a fine felt pen or a waterproof felt pen. I completely abuse using salt in my paintings, but I just love how it looks when dry. I do try to not go overboard though. I've heard about using rubbing alcohol but haven't tried it yet. Looking at some videos though that TokyoMoonlight posted above, I think I'm going to definitely try it out. I often use (water)colour pencils to strenghten colours.